written May 2, 2009 on the GodlikeProduction live chat. Can you comment on the Air Force One escorted by a F16 incident that happened this past monday April 27 in New York City? Was it really a photo session or a blocked terrorism attempt that didn't work for them. Can you please say what happened that day that even President Obama and NYC mayor didn't know of this event. It sure caught people's attention and even evacuated buildings. [and from another] Any secret agenda behind flying a 747 at a low altitude followed by a fighter jet, at 911 sensitive NYC? Surely the people responsible must have know that not warning anyone would have caused panic. Much has been made of this incident because even the official explanation does not make sense. Why have a photo op of an Air Force One plane flying over Ground Zero? Why would the Obama administration even desire this? We have stated that there are many enemies of Obama plotting against him. The whole campaign to get him dismissed as President because of a supposed birth certificate issue is one such campaign. This is still being pressed, but will as we have stated, fail on the merits. There are those within the Republican party who are furious that Obama won and is installed as President. Cheney is livid over having been removed from power. There are individuals within the federal government who can be expected to cooperate with efforts to diminish and at the very least embarrass Obama. This flyover was not at Obama's directives, nor any directive at those close to him in the White House. Those responsible will be dealt with, behind the scenes. Unfortunately, more of this nonsense can be anticipated. Are we at a 6 finally? No, but hold onto your hat, it's a coming. Zetas said last week the engineered virus outbreak in Mexico would not become a pandemic. In the past, Zetas said manmade outbreaks would not be allowed to used as an excuse for implementing martial law and terrorizing the population. Why is this petering-out? Natural causes, human preventive activities, or alien intervention? [and from another] SCENARIOS: What the New Swine Fu Might Do [May 1] http://www.reuters.com/article/GCA-SwineFlu/idUSTRE5406YE20090501 Field investigators at the U.S. Centers for Disease Control and Prevention said it appears the new H1N1 virus outbreak may be more widespread and milder in Mexico than it first appeared. So far the swine flu virus has behaved like seasonal flu as it has spread to 14 countries, carried mostly by travelers from Mexico. The World Health Organization says it cannot be stopped, but has no immediate plans to declare a pandemic - a global outbreak of a new and serious disease. It is very obvious that outside of Mexico, this flu outbreak is not fatal. In fact, it is described as being a very mild flu. Even the toddler who died within the US was Mexican, came from Mexico City on a visit, and has been described as being in poor health even before the infection. Why the difference between infections in Mexico and elsewhere? Cloning activities do not always succeed, due to man's clumsy steps and lack of knowledge. This bio-engineered virus was sliced and slammed together. Flu virus is notorious for mutating, and this one has, in a reverse direction, becoming less lethal as it passed from one to another. All deaths in Mexico have been as a result of being infected directly by the virus from a test tube, including the Mexican toddler who died in Texas. Those who were directly exposed but did not die passed the virus on, but in a modified state. Second hand infections were the passing of modified virus which survived the immune systems of these individuals, and this virus was only one of many in the original mix. What we are telling you is that the strong virus, the one capable of killing people, inciting a 1918 type of response, did not survive in the human body, and thus was not passed. What passed was a second cousin in the mix, which was mild. Can the zetas comment on the retirement of Justice Souter and the party switch of Sen. Spector? Are certain forces lining up behind Obama? Souter does not desire the type of pressure he is anticipating as the swing vote on the court. He has enduring this pressure before, for years, but now that the opposition, the Republican Party, will be trying to force many cases up into the Supreme Court hoping that this court can hold the line on Obama's plans and the Democratic Congress agenda, the pressure will be greater. When a strongly Democratic appointee is installed, this campaign will stop. Why was this "man made flu" allowed to manifest and other attempts blocked? Is it that the lack of severity of the flu itself is a frustration to the martial law types and they will be exposed as people are becoming aware of the man made origins of the flu? On occasion, the clumsy attempts to incite a pandemic during the Bush administration were allowed to proceed to the point where the public could catch the drift of this behind-the-scene effort. The 2005 release of the 1957 bird flu virus to some 4,000 labs worldwide was one such exposure. Likewise, allowing the attempt to pull a nuke from North Dakota through to Louisiana, which was allowed to proceed all the way to the Louisiana base, was very much in the media, exposed to a degree that would not have happened had the nuke been stopped in North Dakota. We stated in the past that attempts to create a pandemic would not succeed, and this attempt did not. But the fact that a bio-engineered attempt had been made is something the public has not missed. Pakistan seems to me to be the most unstable and potentially dangerous country today. Are things likely to get completely out of hand in this nuclear power prior to the shift? We have predicted, since the start of the ZetaTalk saga, that WW III would not occur, that regardless of the tensions between countries that wars would not break out. There is intense pressure on many levels to prevent a nuclear exchange. This is true on the diplomatic level, internally within countries, and on a level above humanity among the aliens visiting Earth at this time. We cannot go into detail, but suffice it to say that we do not expect a nuclear confrontation in Pakistan. 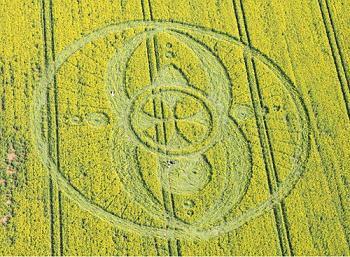 This crop circle represents the wobble, with the variations in the wobble as experienced on various parts of the globe represented where there are differences in the pattern. Where the pattern has consistency in the circle, this represents what would be the normal rotation of the Earth, sans the wobble. Here in Colorado the weather are getting really wild swing. I spoke to some of the local residents who have live here all their lives and they never seen erratic weather like nowaday. Is this year the beginning of food shortage due to extreme wobble? Farmers here in Eastern Colorado usually plant their corns, potatoes, and sugar around this time until mid June. If tempurature keep going below freezing during summer, would plants have difficult surviving? What will the impact of food price? Will crops do well in countries that are near the equator. Or the extreme wobble would impact around the globe? We have stated that the seasons will seem to blend into one another, snow in summer not unusual. We have stated that crop shortages will emerge during the last years before the pole shift, and this has occurred. So yes you can expect more erratic weather, the potential for cold spells in summer, and disrupted crops. If crop shortages occur, as is occurring, of course food prices will rise unless a price freeze is imposed. Countries closer to the Equator have their own weather problems due to drought or deluge and erratic storms, another of our predictions. If we made these predictions, don't be surprised when they come true! Recently the media keep saying things are getting better, including unemployment claims, confident, and tech and bank's earnings. They keep calling green-shoot or mustard seed and the stock market keep soaring. However, I have been looking for a job and notice job advertisement actually getting less and less each week. Here in rural area even worst, barely any listing at all. Can the Zetas comment on the job market, stock market, and the economy. The media is told to chirp the positive, by the many arms that control the media. Confidence is the name of the game, in banking and in the markets, so of course they want confidence increased. They are hoping that small businesses, and individual consumers, feel less insecure and employ people or spend money. But people are still in shock at what happened last fall, and at the depth of the problem, and are clinging to every penny in the main. We have stated that we do not see the economy lifting prior to the pole shift, but continuing to slide. Learn to discern! They are telling you there is no threat until 2012, when Planet X is currenly lurking near the Sun. They are running a lottery for money to help you survive, when money will be worthless in the future. These people are not concerned about you, but are opportunists, the type we have warned about. We will not automatically comment about every such website or group that emerges, as there will be dozens. You must learn to think for yourself and recognize the warning signs! Here it is said about 3 Alternative "They are currently parked on the surface of planets in your Solar System - Mars, the Moon, and a dead planet in orbit opposite your Earth, which you never see as the Sun blocks your view." ../govmt/g13.htm But at the same time you published Dark Twin's photos on ZetaTalk and evidences of other people who saw it. The Dark Twin did not move toward the Earth until the Earth stopped in its orbit in December of 2003. The Alternatives article you quote was written prior to that date, at a time when we did not wish to alert the establishment of the pending halt in Earth's orbit. Thus, we did not mention it in the earlier article. The ancient Maya or Aztecs used a form of fertilizer that had charcoal in it that lasted for hundreds of years but the formula seems to have been lost. Some of the places along the Amazon are still great spots for growing things. Do the Zetas know what the formula was for the future farmers of America? The only long lasting component that would fertilize over years would be a breakdown of rock, such as volcanic rock. It is well known that the soil around volcanoes is fertile for this reason. Will Cannabis be legal or decriminalized anytime soon? This will be the trend, because the prisons are full and this is expensive. Now that Obama has been in power for a few months and is finally filling up the ranks with his own people, is the STO 'new' MJ-12 going to come back into existence again, or is it already in place? Any ongoing conflicts between those people and the STS rump of MJ-12? What occurred during the time of Roswell, when MJ12 was formed, is not the situation today, and thus such a contract between a government and aliens is unlikely to emerge. The present situation is that the number of contactees is increasing rapidly, mass sightings are occurring in many nations, and disclosure is being forced on governments lest they look like they are lying about the issue. MJ12 resulted because Service-to-Self aliens quickly made contact with the US government just prior to when the Council's orders about all contact being only in the subconscious of contactees was to take effect. This forced Service-to-Other aliens to likewise make conscious contact with the US government, to maintain a balance. The US government was overwhelmed, and instituted MJ12 in an attempt to sort it all out, and thus our contract with the US government. But as we said, those times are in the past. As is shown on the map Nancy put together, showing the anticipated flooding after the pole shift when the sea level is expected to rise 675 feet, Colorado will not be affected by such flooding. All rivers will top their banks during the pole shift itself, however. We did not say that a stock of supplies is not wise. Of course it is helpful to have supplies. What we said was to not hoard, which is different. Just when the line is crossed from preparation to hoarding is difficult to define, and would be judged differently from one locale to another. Hoarding, however defined, is likely to make you a target by those who are without. This was our warning. Are GWEN and ELF being used specifically to create fear during this pandemic? It seems that the fear level was very high early in the week and now it is very calm, almost suppressed feeling. I usually don't feel strong fear but it seems everyone was swept up early in the week. I kept thinking 'this is coming from an outside source.' What say you? The government programs you mentioned are used for long distance communication, using the Earth itself as a vibration vehicle. If you felt swept up in fear during the earlier part of this week, and now feel somewhat relieved, you were probably tapping into the collective conscious, i.e. telepathy with others. It is hard not to think something evil is coming your way when schools are being closed, the media is showing photos of people wearing face masks, and the Mexican government is announcing deaths every day. Now that the results are in, this is all being considered an unnecessary panic, but based on the first few cases, the possibillity of a flu where 5% of those affected would die was considered a real potential. This is the what the virus makers intended, and was what those originally infected experienced. As we said, this virus did not survive those originally infected and only a milder cousin in the mix was passed from human to human. I have been reading about peoples NDE experiences and how their life changes afterwords. How they see the world in a new light. Is there a way to experience this higher self / ultimate knowledge, etc without causing ones harm? What I mean is there another way than dying and coming back to life? All incarnations involve an intelligent body that at birth is unaware of the spirit incarnating and its past lives. A NDE, when the soul shares this experience with the human incarnated, allows the human body to become aware of the spiritual depth the soul carries with it. This type of knowledge can be shared without an NDE having to occur, of course, as many human bodies, particularly those incarnated by very old souls, will attest. I see you respond to questions that you barely can make out sometimes, and state that you don't understand the question? So why leave other questions that seem more valid, or interesting and could benefit the rest of us unanswered? I remember not getting an answer to my Spirit guides question? Where do they exist? Who guides them, what dimension are they in? And I still can't accept that we need to go through a genetic upgrade where we will look half Zeta, when the Plaedians, Nordics, etc. look a lot like us already, and posses similar abilities to you? Don't these beings exist in similar dimensions than you? Why don't they require to look half Zeta? Is it because you need us to fix or add something missing in your species? Thank you for your time, I am a human becoming, help me to become! Nancy essentially takes the questions posed during the chat one at a time, else she and we are accused of avoiding questions. Your question about Spirit Guides is already answered on the ZetaTalk website. They are souls who have graduated beyond your current level, doing service by assisting young souls to get the lessons, the opportunities they need for growth. Your resentment on not being able to dictate the future of your incarnations is palpable. You are a baby, and don't get to call the shots, however. We would suggest that you not spend too much energy fuming about becoming a Zeta/Human hybrid. Your next incarnation will be as an intelligent octopi, instead, among the undecided. I too am curious about the scalar weaponry delivery of disease along with the question of GWEN, ELF having impression on raising the fear energy in the past week. HAARP has been my impression, what do Zeta's say of this? I truly would like to get feed-back. HAARP, as we has been stated on the ZetaTalk website for years now is simply a government program to measure the Earth's magnetic field. It is rumor that it is some kind of program whereby the government can cause earthquakes and the like, complete disinformation to make the government look strong, in the eyes of the gulible public such as yourself. The absurd is happening in the world, in social and economic level. Here in Brazil, the south is heat, which is usually cold in this period, and the north is getting cold. Myth is raining in the north, where it was dry, and the south, which is responsible for agricultural production in the country, is not raining. The planet is experiencing a little hell. When will this improve? Or the Planet X is knocking the door? Planet X has been affecting the weather since before 1995, when ZetaTalk began. We described the weather changes to expect at that time, and time has born out our predictions - increasing drought and deluge, switching about, increasing temperature extremes, and weather atypical for the seasons to the extent that the seasons will seem to blend into one another. This will only get worse as the time of the pole shift approaches. Is it desirable for Obama and/or NASA/Air Force to disclose the "alien presence" and Planet X at this time or just have things remain as they are until the shift? Both these issues come with immense baggage. The alien presence has been denied for decades, since the time of Roswell, and aggressively so. The individuals who perpetrated this cover-up are still in the main alive, and do not want egg on their faces. What would they say to the public, that the common man could not take the information without going insane or into a panic? This is laughable in view of the large number of mass sightings which have only resulted in curiosity and increased desire for contact. To save face, these individuals demand that the cover-up continue, and the discussion continues behind closed doors. It is the public that is pushing this cover-up to fall, and little by little, it will. As for the cover-up over the presence of Planet X, this is unlikely to fall until one of two things happen. First, when many involved in the cover-up leak the truth, or inadvertently blurt out the truth when the cameras are live. This is highly likely to occur because those in the know often anquish over the cover-up, feeling that the public has a right to know. Second, when some evidence of the presence of Planet X presents itself to the public. Just what this might be is something we cannot say, as it is to be a surprise to the establishment.